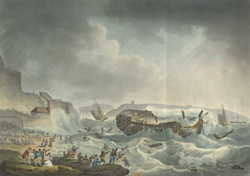 View of a ship called the Dutton East Indiaman becoming wrecked in a storm off Plymouth in 1796. The ship called the Dutton was built on the Thames in 1781 and chartered by the East India Company. It was intended to ferry troops to the West Indies. However it was wrecked off Plymouth Sound by a storm. The rescue attempts are shown here: scores of troops are holding down ropes to stop the ship drifting out to sea. Meanwhile, some of the people on board are attempting to move along the ropes to the shore. The ship is in a bad state with no mast and the sea is littered with its debris. This print is dedicated to Admiral Sir Edward Pellew, Viscount Exmouth, who was in charge of the ship.